Aunt Buxton's Pudding. 1 cup of sour milk " " " molasses 1/4 " " butter Make a batter of it. Add one teaspoonful of cloves, and the same of ginger. Steam 1 1/2 or 2 hours. 1 teaspoonful of soda. Sponge pudding. 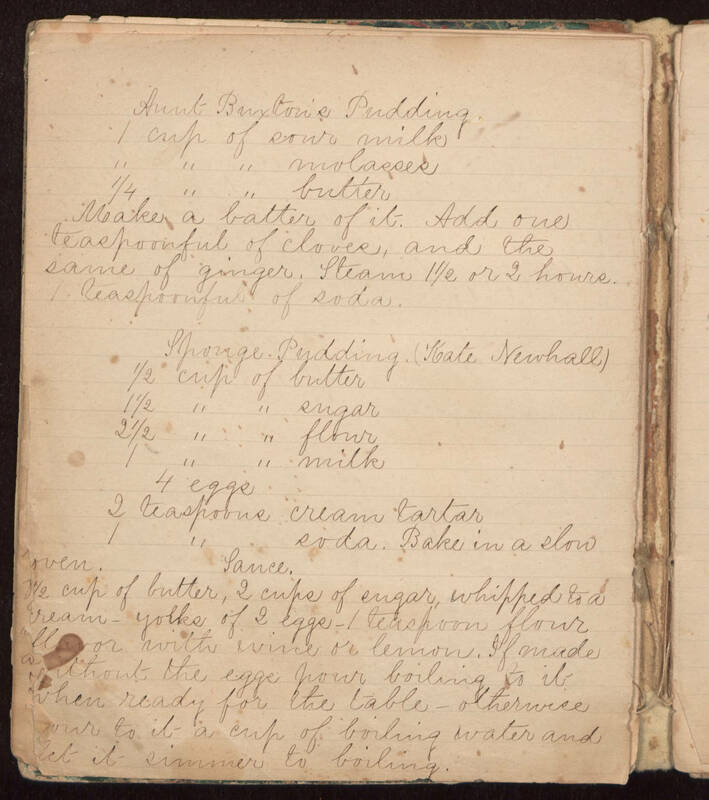 (Kate Newhall) 1/2 cup of butter 1 1/2 " " sugar 2 1/2 " " flour 1 " " milk 4 eggs 2 teaspoons cream tartar 1 " soda. Bake in a slow oven Sauce. [1 1/2?] cup of butter, 2 cups of sugar, whipped to a cream - yolks of 2 eggs - 1 teaspoon flour flavor with wine or lemon. If made [without?] the eggs pour boiling to it when ready for the table - otherwise pour to it a cup of boiling water and let it simmer to boiling.